The Kroc Center Athletic Department welcomes children and adults of all ages and abilities. Offering affordable athletic programs and an experienced staff, state of the art facility that boasts a gymnasium and stadium which converts into multiple courts and fields. We also have a 6 lane running track; we are sure we have the program that best fits you. Looking for a Special Athletic Program? 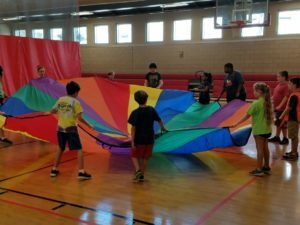 Here are a few programs offered at Kroc Center. Please call the Kroc Center at 228-374-9111 for additional sporting activities that are also available such as Pickleball, LaCrosse, Indoor & Field Hockey, and Flag Football. Note: you do not have to be a member of The Salvation Army Kroc Center to participate in the athletic programs. Personal training is available for the more serious athlete that is highly motivated, passionate, and ready to put in the work to achieve their goals. 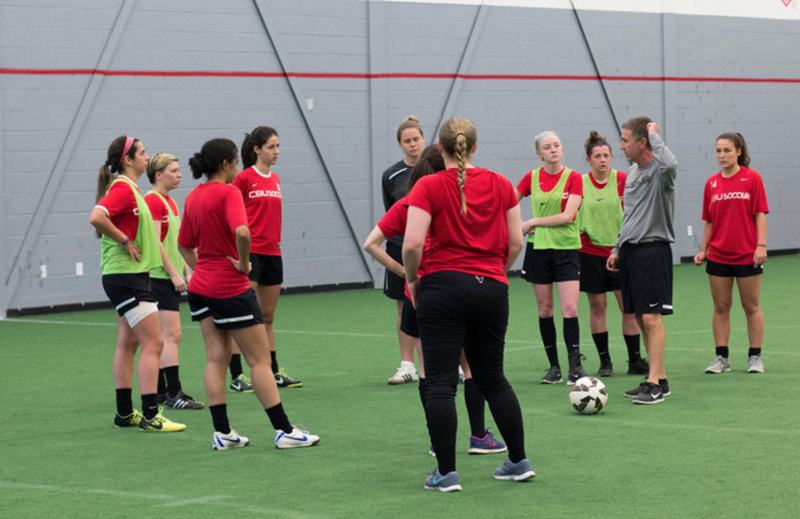 Our staff is equipped with the knowledge and experience to provide the novice to the advanced athlete in the following areas: weights, speed & agility training, basketball, volleyball, soccer, football, and track. Call for an appointment and a goal assessment 228-374-9111. A six-week development program targeted for the young athlete. If you want to know what sport your young athlete is interested in, short sports is the program for you. We will introduce the fundamentals of three sports through drills and fun games. If you have any questions please contact Ramon Santiago 228-374-9111. Offered every Thursday. Join the fun games and sports! Our staff provides Physical Education to local elementary schools as well as Home School. We can also organize your school’s Field Days. Please call 228-374-9111 for more information. Camps are offered during school breaks and summer. Athletes receive great instruction at an affordable price. We offer basketball, volleyball, soccer, baseball, football, and track camps. Slots fill up fast so register as soon as advertised. During Open Court Basketball, the gymnasium is available for anyone to play. The fee for non-members to play is $3. Call The Salvation Army Kroc Center for times, as they change depending on various programs and events. Looking for a great place to register your child for youth basketball? 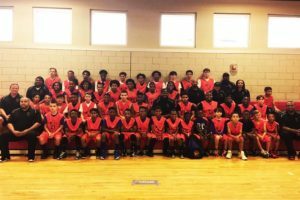 Join our youth basketball program, we offer one of the best courts on the coast, quality coaching, and high school level officiating. 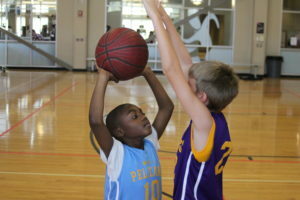 Youth Basketball League is our boys and girls recreational league. This league designed to develop all registered players in the game of basketball. The Kroc league is one of the best on the coast and is quickly growing. Our teams play city equivalent leagues in the surrounding area. We have some away games during the week, but most will be played on Saturdays. Come and join our league and watch your players grow! If you have any questions, please call Coach Santiago 228-374-9111. For the serious basketball player looking for a challenge. Come play and test your skills against exceptional athletes from around the Nation at various tournaments. 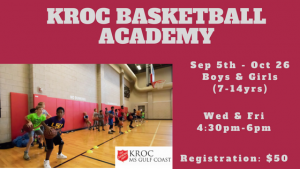 The Kroc Elite Basketball program is open to 3rd – 8th-grade boys and 7th – 8th-grade girls. This is a very competitive club; players must tryout to make the team; players will strengthen their confidence and sharpen their skills through practices and higher level competition. By season end your player will be ready for school ball. IF YOU HAVE WHAT IT TAKES….WE WANT YOU! Cost: $225 per player on the team. Tuition Due: March 1, 2018. An afterschool program designed to enhance fundamentals and their upcoming basketball leagues. Afterschool transportation is available from select schools (for an additional fee). An afterschool program designed to enhance fundamentals and their upcoming basketball leagues. 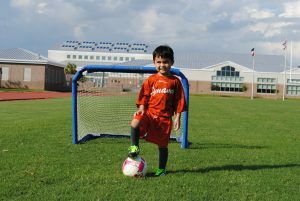 The Kroc Center Youth Soccer League is for boys and girls ages 3-8. Teams will be formed in the following age groups: 3-4, 5-6, 7-8. Cut off date for age is Feb 1st of the year of registrations; upon registering please bring a copy of the players birth certificate. 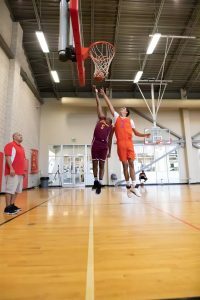 Players do not need to be a member of the Salvation Army Kroc Center to participate in the league. Each team will have one practice a week. Most games will be played on Thursdays; there may be other game days. Cost: $50 for members and $65 for potential members (Price does not include required cleats or shin guards). join us for Thursday night volleyball! You can bring your friends, or just come and join in on the fun. We have talented players who travel from across the coast to play in this indoor competitive session. For more details please see the Athletic Department. Come join one of the youngest and fastest growing sports on the Mississippi Gulf Coast: learn the game, enhance your fundamentals and develop as a player. Looking for a Volleyball Camp? Our 5-week summer academy will build confidence, enhance fundamentals, and prepare players for their school, league, and/ or club seasons. Come out and train or just improve your fitness level. We will focus on developing athletes speed, endurance, strength, fitness and teamwork through disciplined training of running fundamentals and techniques. If you are looking for a race, come run our Frosty Kroc in January, and our Kroc and Roll Sunset race in July; we have a great route across the Biloxi/ Ocean Springs bridge with beautiful views, healthy competition and we have a lot of fun. 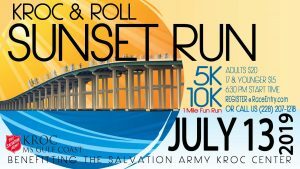 All proceeds raised from these races go towards The Salvation Army Kroc Center Scholarship fund, which enables less fortunate families the ability to enjoy the many amenities our facility has to offer.